October 18, 1881 Born Aberdeen, Scotland to Mr. and Margaret Burns. She is recorded to reside during his service at 89 Victoria Road, Aberdeen, Scotland. 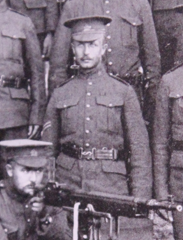 April 9, 1915 Enlists Enlists at Toronto, Ontario. He is a Thirty-Three-year-old machinist. Standing 5’7” he is taller than average for a recruit of the C.E.F. April 14, 1915 Inoculated First of three inoculations with anti-typhoid serum. April 17, 1915 Inoculated Second of three inoculations with anti-typhoid serum. April 23, 1915 Inoculated Last of three inoculations with anti-typhoid serum. October 1, 1915 Assigns Pay Assigns pay at a rate of $20.00 per month to his mother, Mrs. W. Burns, 89 Victoria Road, Aberdeen, Scotland. October 16, 1915 Embarks for England Boards the S.S. Metagami at Montreal, Quebec. March 20, 1916 T.O.S. C.O.C. Taken on Strength with the Canadian Ordnance Corp as an Acting/Corporal, Ashford, England. August 9, 1916 T.O.S. C.A.I.R.D. Taken on Strength with the Canadian Arms Inspection and Repair Depot. September 29, 1916 Admitted to Convalescent Hospital, Bromley Admitted with a case of scabies. September 28, 1916 Receiving Treatment Receives treatment for scabies at Canadian Convalescent Hospital, Bromley, Kent. Date Unknown Marries Marries Beatrice (nee unknown) Burns who is recorded to live at Surrey House, Gloucester View, Southsea, England. There is a note of a change of the Assigned Pay from Private Burns’ mother to his wife. April 20, 1917 T.O.S. 4th Reserve Battalion Taken on Strength with the 4th Reserve Battalion, Bramshott. June 24, 1917 Writes Will Gives his estate to his wife, Beatrice Burns. August 23, 1917 Proceeds Overseas S.O.S. 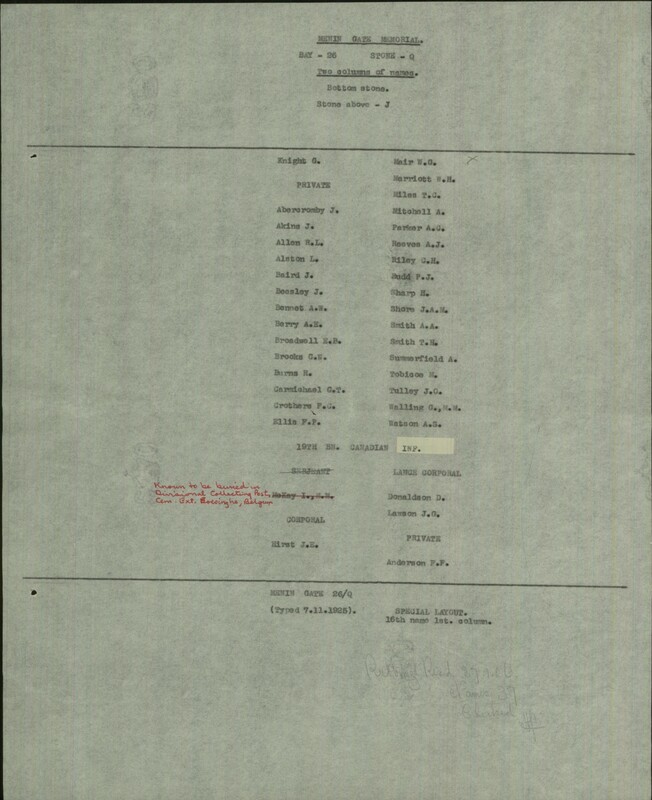 4th Reservice Battalion and T.O.S. 18th Battalion. 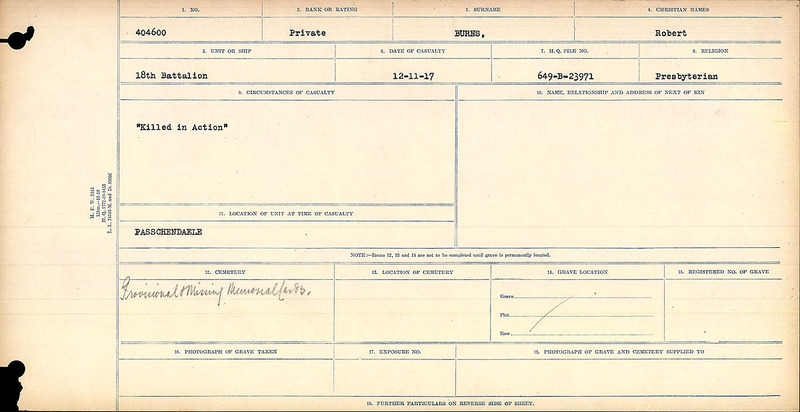 August 24, 1917 Reverts to Private Reverts to private as he is assigned to an active combat unit. Reverting to a lower rank was common and not a reflection on the soldier’s martial skills or discipline. Soldiers were reverted to a lower rank as they lacked the combat experience to lead men and the battalions needed privates more than non-commissioned officers. August 25, 1917 Arrives Canadian Infantry Base Depot Arrives C.I.B.D. and is taken on strength with the 18th Battalion. September 5, 1917 Joins Battalion In the Field The Battalion is in Brigade Reserve at Villers-Aus-Bois. November 12, 1917 Killed in Action Private Burns in killed in action at Passchendaele and commemorated on the Menin Gate. February 27, 1921 Pension Gratuity Paid A cheque numbered G1903807 in the amount of $100.00 is issued to Private Burns’ widow, Mrs. Beatrice Ada Burns residing at 235 West 148th Street, New York, New York, U.S.A.